Metasequoia redwood fossils are known from many areas in the Northern Hemisphere; more than twenty fossil species have been named (some were even identified as the genus Sequoia), but are considered as just three species, M. foxii, M. milleri, and M. occidentalis (Farjon 2005). During the Paleocene-Eocene Thermal Maximum, extensive forests of Metasequoia occurred as far north as Axel Heiberg Island (northern Canada) at around 80°N latitude. Large petrified trunks and stumps of the extinct Metasequoia occidentalis (sometimes identified as Sequoia occidentalis) also make up the major portion of Tertiary fossil plant material in the badlands of western North Dakota in the United States. The trees are well known from late Cretaceous to Miocene strata, but no fossils are known after that. Before its discovery, the taxon was believed to have become extinct during the Miocene; when it was discovered extant, it was heralded as a "living fossil". 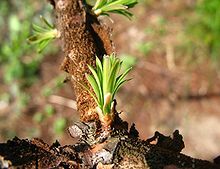 While the bark and foliage are similar to another closely related redwood genus Sequoia, Metasequoia differs from the California redwood in that it is deciduous like Taxodium distichum (Bald Cypress), and like that species, older specimens form wide buttresses on the lower trunk. It is a fast-growing tree to 40-45 m tall and 2 m trunk diameter in cultivation so far (with the potential to grow to even greater heights). 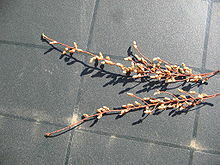 The leaves are opposite, 1-3 cm long, and bright fresh green, turning a foxy red-brown in fall. 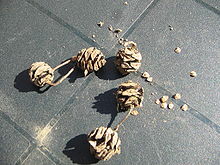 The pollen cones are 5-6 mm long, produced on long spikes in early spring; they are only produced on trees growing in regions with hot summers. The cones are globose to ovoid, 1.5-2.5 cm in diameter with 16-28 scales, arranged in opposite pairs in four rows, each pair at right angles to the adjacent pair; they mature in about 8–9 months after pollination. Metasequoia was first described as a fossil from the Mesozoic Era by Shigeru Miki in 1941, but in 1944 a small stand of an unidentified tree was discovered in China in Modaoxi by Zhan Wang; due to World War II, these were not studied further until 1946 and only finally described as a new living species of Metasequoia in 1948 by Wan Chun Cheng and Hu Hsen Hsu. In 1948 the Arnold Arboretum of Harvard University sent an expedition to collect seeds and, soon after, seedling trees were distributed to various universities and arboreta worldwide for growth trials.